Great Pond Marina is the Boating Headquarters of Belgrade Lakes. For over 50 years, the Marina has been the center of boating in Belgrade Lakes. Whether you wish to rent a boat for the family vacation or for a day on the lake, or if you need a mooring installed, or if you need to upgrade your dock or purchase a boat lift, Great Pond Marina in Belgrade is ready to serve you. Customer Service is our specialty. 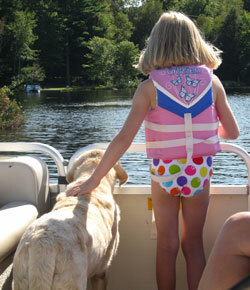 Year after year our customers return for Boat Rentals, because "We get you on the water fast". As we say "Enjoy Great Pond at its Best "From the Water"
Bob & Debbie Gardner purchased the marina in 1991 from Dave Webster, the original “Mail Boat Captain” in Ernest Thompson’s play and later movie, "On Golden Pond". Now with renewed energy, the helm is being passed on to their sons, Adam and Jason, and daughter Jessica "along with daughter-in-law Stephanie. 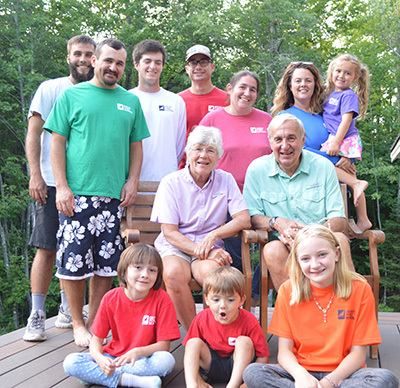 Besides running the Marina, the Gardner’s have been involved in numerous community organizations including Board Members of the Belgrade Lakes Region Business Group, the Maine Marine Trade Organization, Maine Committee for Invasive Species, and DEP Committee for Marina Best Management Practices, and Adam was on the Board of Directors of the Belgrade Lakes Association. This year we plan to expand our O'Brien Watersports display area offering more in a full line of towable tubes, skis, wake boards, stand-up paddle boards, ski jackets and accessories. The O’Brien name has been famous for more than 50 years for quality, performance, and value. While the marina has been a O'Brien dealer for over 30 years, with prices that have been very competitive, plus we handle any warranty adjustments in-house. Great Pond is the largest of the chain of Belgrade Lakes and is prized for its clear waters, famous bass & northern pike fisheries, and vacation cottages. It is eight miles long and five miles wide with 8000 acres of water. Belgrade Lakes has been a destination for summer vacationers for decades, with generations returning each year for their summer memories.